This episode is basically no matter how I look at it, it’s your fault my fake girlfriend is unpopular! And also Moedera being suspicious, but what else is new? They’re actually getting along here. Well, Chitoge isn’t exactly unpopular per se. Rather, she just has trouble reaching out to others even when they’re making the effort to get to know her. Thanks to this issue though, Raku is able to score some points by giving her pointers on how to interact with her classmates as he’s been through the same thing before due to their similar positions as gang heirs. Now at this point, we might expect their relationship to mellow out a bit, but unfortunately this isn’t the case. Or is it? I believe that in spite of their continuing bickering, the two have definitely gotten closer and closer. They’re spending more time together, helping each other out with the “charade,” and even depending on each other now. But of course, there’s still a distance between them. Raku isn’t exactly sharp when dealing with Chitoge or girls in general (he totally froze up with Onodera), though he makes up for this by following up on his mistakes. On the other hand, Chitoge is always quick to verbally and physically abuse Raku, but recently she’s been holding back on at least the physical part. So I suppose the best way to put it is that the two are currently at the stage of awkward friends. Their relationship might have been forcefully jump-started due to extenuating circumstances, but the progress they’ve made until this point is real. As I write this, my RSS feed just picked up episode four of the show. Let that say something about how late this post is. But I digress. 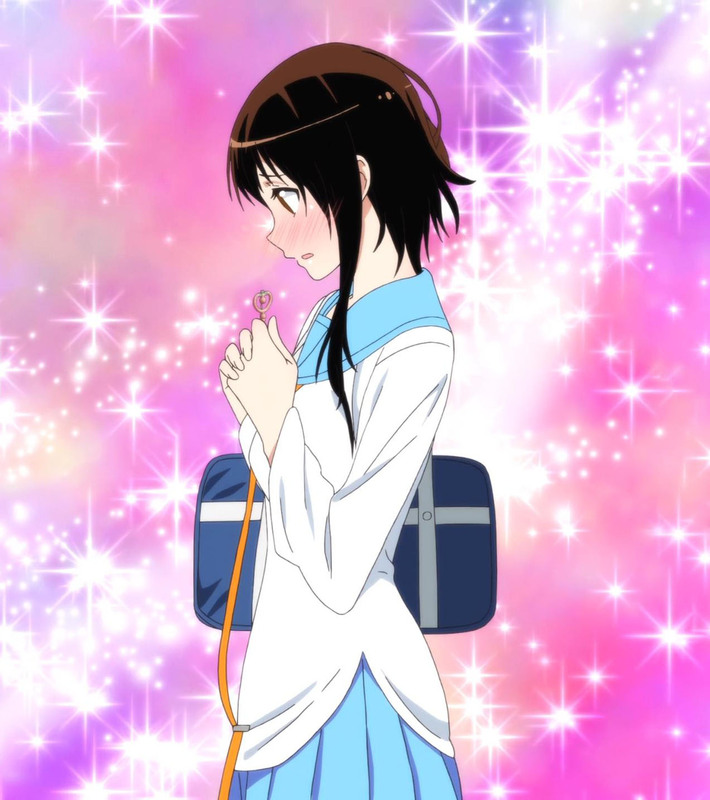 The other main point Nisekoi has been feeding us is the possibility that Onodera might be the mysterious childhood sweetheart. There have been many such indications before, and just when I thought the show couldn’t be any more overt about it, it outdoes itself with Onodera dropping her key in front of Raku. Well gee, this is awkward. But then Raku just accepts that there’s nothing more to the key? To give him credit, there’s objectively no real evidence from his point of view to support the theory that she might be the girl of his past. But can’t he take a hint from all the circumstantial evidence? Onodera specifically brought up that his childhood crush might still be holding on to her key and intending to uphold their promise. Then she acts all fishy when she sees the pendant and is asked about it. Now, she even accidentally reveals that she has a key that’s just about the right size for the pendant and when confronted about it panics and runs away. How can Raku turn a blind eye to all these things just because she told him once that she’s never seen his pendant before? Has he never considered that she might be lying even if he’s known her for a while? In fact, shouldn’t he be even more suspicious of her present behavior precisely because he’s known her for so long? Onodera always has the most convenient timing. Continuing on this subject, and a question I pondered last time, why exactly is Onodera being cryptic about the whole thing? My previous thoughts were that perhaps she’s finding it awkward to bring up the subject since she couldn’t do so for so long. Which is pretty stupid if you ask me. But I think that whatever her original reasons may be, it has now been further complicated by the fact that she thinks Raku and Chitoge are going out. You know, something like she wants to respect who Raku chooses to be with and thus doesn’t want to get between them. Even though those two are acting rather suspicious themselves with their constant attempts to deny their relationship. But now that she’s overheard them more or less exposing the truth of their own situation, I wonder if she might start to be more proactive about Raku. Or perhaps she’ll just go back to being tied down by whatever was making her hesitate in the first place. All of this is Moedera stuff is made out to be fairly straight forward and obvious. But then what is the deal with the show’s ED? I mean, if there’s ever anything more overt than Moedera’s actions in the show, it’s that ED. Having now seen that flashback of the mystery sweetheart sitting on the rock under the moon, the bit in the ED with a younger Chitoge perched on a rock is mighty suspicious. Though I should add that in the manga the unknown girl’s hair seems more reminiscent of Moedera’s with that lock of hair on the left (which might in turn also not mean much). And what’s up with the silhoutte of a young Raku and Chitoge holding hands? Hmm? If I didn’t know better, I would say the ED is pretty much revealing Chitoge to be the real mystery childhood crush. Except so far she’s shown no such hints of this past in the actual show. So why the seemingly contradictory content then? Well, the answer to that is pretty obvious, but let the rhetorical question stand. The resemblance is more pronounced in the manga. If you’re curious, this episode covers chapters 5 and 6 in the manga. So it looks like the show might be settling down for a 2-3 chapters per episode pace. I’m just keeping in mind what I said at the beginning of this series: It’s 12 episodes of romance blue balls. I doubt we’ll ever find out anything definitive, and everyone’s gonna act like a dope the whole time. On another note, I’m started to get a little too distracted by the SHAFTiness of this production. I don’t think it’s a good thing when the quirks of the studio start to be the things that command your attention, rather than subtly add to the presentation. There were a lot of Monogatari vibes coming from how the angles were being presented. Like you’re seeing frames but with the characters in the distance. I really feel for those two constantly being hounded by Chitoge’s bodyguard Claude. The guy needs a beating though because he’s doesn’t realize he’s the reason for Chitoge’s isolation and difficulty to interact with others. Things were pretty much alright and we get a bit of suspense with Onodera getting wise to their little ruse. The only downside was Raku’s annoying best friend. He’s way too obnoxious if you ask me.